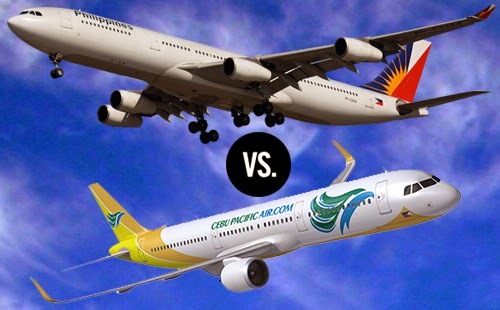 Philippine Airlines Vs. Cebu Pacific Air – Which One is the Best? It is no wonder why Cebu Pacific coined its slogan, “Why everyone flies.”, being a very budget-friendly airline, it has become the largest carrier in the Philippines for some years now, flying to 34 domestic destinations locally, and to 24 international destinations, in a total of 14 countries abroad. On the other hand, Philippine flag carrier and airline pioneer in the country, Philippine Airlines, is the thirteenth-largest corporation in the Philippines in terms of revenue and the twenty-first largest in terms of assets, as stated in the Philippines' Top 500 Largest Corporations of 2005, according to Wikipedia. Either companies, although not perfect and having had experienced mishaps in the past like any other business establishments, both strive to be the consistent leaders in gaining the most domestic and international passenger traffic, vis-à-vis aiming at providing the best service. It will be injustice done, however, should THE best airline between these two mentioned above, be given such a title, since both airlines are evidently close competitors in terms of overall consumerism. * Flew first Boeing Jumbo Jet in 1980.